Deb's Cup of Tea: No smell. Perhaps you know of studies linking PVC's, polyvinylchlorides, to all sorts of suspected health problems. Perhaps you also know about the move to boycott Target until they removed from sale all the items that contained PVC. My search seems to put this movement as starting in 2006 in a very limited fashion, although I didn't hear about it until early this year. There was an article in October listing a few things still for sale at Target which contained PVCs. I have a shower curtain with the pattern of brightly colored fish. "Some day" I will finish making the bathroom an undersea paradise with fish swimming on the walls. It's close but it isn't there. The shower curtain is part of the decor. I use a plastic liner. I know. I know. I could go to Gaiam.com and get a natural shower curtain that I just toss in the wash. This would, in the long run, be more cost effective. But, at $58, it's a bit pricey for me. And, frankly, when I think, "Oh I could get a natural curtain I could just wash, is when I can just add a new liner to the Target list. In the past, I have dreaded buying a new liner and I've put it off until I couldn't stand the old one or it might be a health hazard. The smell when you open that package and hang up the new liner always got to me. I'd be coughing and sneezing within the hour. But, last weekend, I could put it off no longer. The old liner was brittle and had cracked in one spot letting water run onto the bathroom floor. I knew about the Target boycott and was dreading buying an inexpensive liner that still contained PVC's. I'm sure that's what caused my reaction. For $5.99, I got the one shown above. The print on the package says "No PVC's". My nose will be the judge of that. I was very surprised and quite happy when I opened the package (outside on the deck, mind you, to dissipate the anticipated fumes) and there was no plastic smell. None. Zero. Zip. Zilch. The whole package also appears to be recyclable as that placard slips out of a pocket on the package and it's paper. Now, I didn't look at sizes so this curtain isn't as wide as the other one but it's long, wonderfully long. 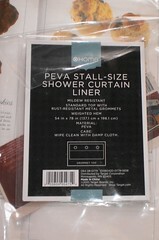 That's always been a complaint, that shower curtain liners weren't long enough. They rested on the top of the tub which lets water seep under them and onto the floor. This one goes a good 3 inches below the rim. No water on my floor now. I've had no problems with smell. I like that I can walk into my bathroom and not have a coughing fit. I'm sensitive enough as it is right now. I don't need extra olfactory assaults. We'll see how long this liner lasts. With it being smaller in width than previous liners, there's no folding in on itself and the whole thing air dries. I like that. For $5.99, I can't beat the price either.